The Department of Computer Science emphasizes on a broad and fundamental research foundation as well as a deep integration within the university, with the scientific community, as well as with industry partners. 20 professors and about 200 research staff and PhD students are internationally renowned for their world-class research. This is also the basis for an excellent teaching program. Our students can attest the quality and depth of the study program; they directly influence the quality through dedicated evaluation programs. Our future research areas are built to support the following two main fields: Cyber Physical Systems and Distributed Computing. This also includes topics such as the improvement of technical products by means of modern computer science methodologies towards integrated information and communication technologies (ICT) and mechatronic systems, as well as the involvement of computer science for the development of smallest embedded systems for every-days use. Here, we face novel challenges of scale and complexity in world-wide networks and modern ICT systems, as well as the continuous internationalization of software engineering. In fundamental research, the Department of Computer Science is continuously engaged in DFG collaborative research centers and research training groups. As such, it is also representative for the internationally renowned and interdisciplinary working Heinz Nixdorf Institute. 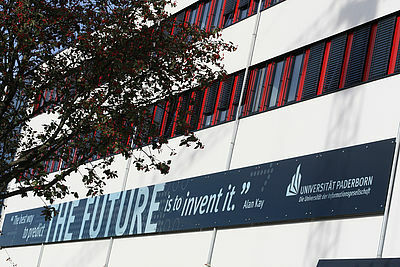 In more application-oriented research, the department is host for a number of excellent research institutes such as the Paderborn Center for Parallel Computing (PC²), the Cooperative Computing and Communication Laboratory (C-LAB), and the Software Innovation Campus Paderborn (SICP), that also tie links to the local industry.